Mt Stapylton and Hollow Mountain are located at the northern tip of the Grampians range, 30km south of Horsham. The area is most easily accessed from the Western Highway (A8). From the southeast (Melbourne side): follow the A8 towards Horsham. Ten kilometres past the terrifying Giant Koala at Dadswell Bridge, turn left onto Wonwondah–Dadswell Bridge Rd (70km from Ararat). Continue for 2.8km and turn left onto Flat Rock Rd for 3km before turning right onto Mt Zero Rd. After 1.4km there is a turn-off to Hollow Mountain car park. Continue past this for 1.1km and turn left to get to the Mt Zero/Flat Rock Picnic Area. From the northwest (Adelaide side): follow the A8 south from Horsham for 14km and turn right onto Drung South Rd (C222). Continue for 7.8km and turn left onto Wonwondah–Dadswell Bridge Rd for 3.1km. Turn right onto Winfields Rd and then take the first left onto Mt Zero Rd. The dirt road winds around the side of Mt Zero for 2.1km and meets Mt Zero Rd. Just to the right of this intersection is the Mt Zero/Flat Rock Picnic Area. To get to the Hollow Mountain car park, turn left and drive up Mt Zero Rd for 1.1km. Halls Gap is located on the eastern side of the Grampians. From the east (Melbourne side): follow the Western Highway (A8) to Ararat. At Ararat leave the Western Highway and follow the Ararat–Halls Gap Rd (C222) for 48.2km to Halls Gap. From the north (Horsham or Mt Stapylton): the best way for you car is to take the Northern Grampians Rd (C222) south to Halls Gap. From Stapylton you can also take the Mt Zero Rd south around the eastern edge of the Grampians – it’s the shortest route, but it’s a dirt road and quite slow if you don’t have a 4WD. Venus Baths: it is very close to the centre of Halls Gaps. See the Venus Baths section in Grampians Bouldering for further directions. Bleachers: take the Northern Grampians Rd (C222) west from Halls Gap (the turn-off is just north of the main strip). After 4.8 windy kilometres turn left onto the Silverband Rd. Silverband Rd is followed for 2.3km before making a left turn onto Sundial Rd, which is followed for 1.1km to the Sundial car park. Alternatively, if you are coming from the north, follow the Northern Grampians Rd (C222), until you can turn right onto the Silverband Rd, after which you follow the previous instructions. For further directions see the Bleachers section in Grampians Bouldering. Valley of the Giants: the route is similar to the Bleachers, except that you continue on the Silverband Rd for 5km once you turn off the Northern Grampians Rd. Once you get to the Rosea car park, you can either park there or drive a further 1.2km down the Silverband Rd. See the Valley of the Giants section in Grampians Bouldering for further directions. 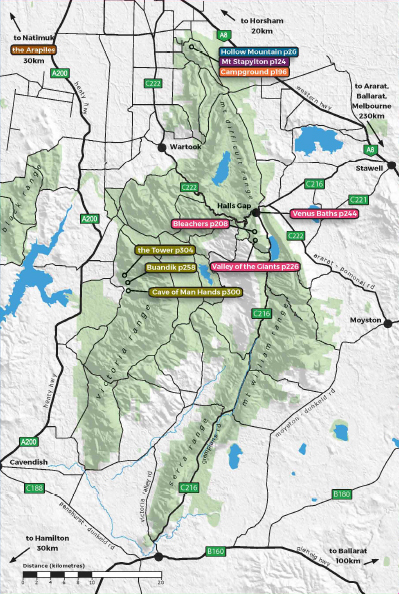 The areas in the Victoria Range are all close to Buandik Campground in the southwest Grampians. Coming from the Melbourne-side of the Grampians there are two main ways to get to the Victoria Range, the shortest is via Halls Gap and involves a lot of dirt roads, the second, longer way is to come around the top of the Grampians past Stapylton. Via Halls Gap: follow the instructions for getting to Halls Gap. From Halls Gap take the Northern Grampians Rd (C222) for 7.8km, turning left onto the Glenelg River Rd (shortly after you turn-off there’s a junction, turn right). Follow the Glenelg River Rd for 11km until you can turn right onto Lodge Rd. Follow Lodge Rd for 12km until you can turn left onto Red Rock Rd. Just over 5km south along Red Rock Rd you will reach the turn-off to the Tower on the left (see the Tower section in Grampians Bouldering for further directions), another kilometre further on, turn left onto Billywing Rd. Follow Billywing Rd south for 4.6km, until you see the turn-off for Buandik Campground (the parking for the Cave of Man Hands is 1.2km further south, see Grampians Bouldering for further directions). Turn left and you will soon see Buandik Campground on the left and the picnic area just past it. For further directions, see the Buandik section in Grampians Bouldering. Via the north: coming from either from Horsham or Stapylton, it’s best to take the Henty Highway (A200). From the Henty, turn left onto Billywing Rd and follow the signs to Buandik Campground. To get to the Henty Highway from the Western Highway (or Stapylton), turn off the highway onto the Wonwondah–Dadswell Bridge Rd. Follow it for 9.3km, turn south onto the Northern Grampians Rd (C222), drive for 12.5km, then turn right onto the Brimpaen-Laharum Rd, which is followed all the way until it meets the Henty Highway. Turn left and drive south for 26km, where you turn left onto Billywing Rd and follow the signs to Buandik Campground. Sadly, you pretty much need a car to boulder in the Grampians. The nearest public transport hubs are Horsham and Halls Gap, which are serviced by VLine buses. The only area accessible via public transport is Venus Baths, which is just a short walk from the centre of Halls Gap. See www.vline.com.au for more information.